As I write this, we are starting to wind down from several busy days. Christmas Day itself, we try to keep more of a quiet affair. 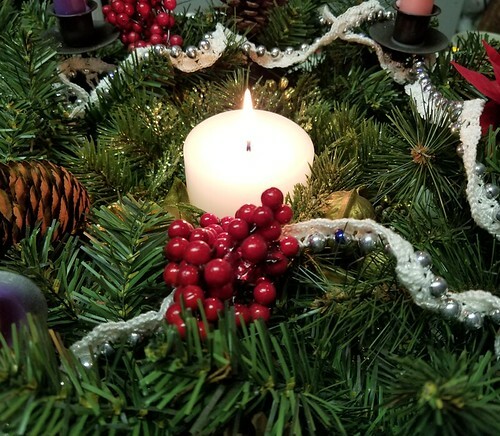 The fifth candle of our advent wreath has been lit, we have had our dinner, and it is time to get some rest before we continue with our holiday activities. I was finally able to get my mother over to visit her sister in the nursing home this past Sunday. My aunt was not as lucid as she was, the last time we saw her. While we were there, the staff got her out of bed and into her wheelchair, and we sat with her in one of the lounge/dining rooms. She kept staring at me, and I could tell she was trying to figure me out. My mother told me later that, as she was giving final hugs goodbye as I left to get the van to the door for my mother, my aunt asked her if I was a Jehovah’s Witness. !! 😀 Not what I expected to hear! I was intending to take my mother out for dinner as my Christmas gift to her, but the visit tired her and it was already starting to get dark, so she told me that bringing her to see her sister was all the gift she wanted. I’d like to say that it all went well, but as always with my mother, she found some way to turn good into bad. Even when she saw the gift bag I’d brought for her sister was criticized, because why would my aunt need something in such a big bag? She had no idea what was in the bag, but whatever it was, her sister didn’t need it, all based on the size of the bag it was in. I never did show it to her, and left the bag for my cousin to find and give to her mom. I’d crocheted a wheelchair capelet to keep my aunt’s shoulders warm, out of soft, warm bamboo yarn. I knew my cousin would understand the care instructions I included with the card inside, and could better explain to my aunt what it was, and where it came from. Of course, that wasn’t the only thing. Somehow, my mother managed to ding me on everything from how I needed to sweep and mop more often and keep the house clean, like she did (she has no idea the state of the house), to ordering me not to go to the dump any more, but to burn our garbage, like she did, to demanding that I was not to cut down any more live trees at all; she planted every one of them, and they are there for a reason (I did throw her for a loop when I asked her if that included the trees growing through the tractor), and of course, she went on a tangent about our not going to church anymore. I’ve told her why, but she’s decided she knows better than I do about why we haven’t been going to church, and that’s what she chooses to criticize me for. It got pretty rough there for a while, before I could distract the conversation away. Christmas Eve was our busiest day – more so than expected. Regardless of what else is going on, though, some things don’t change – like the morning feeding of the critters! One of the last minute changes was a trip into town to get the things I wasn’t able to get the day before, as I was out with my mother, instead (though I was able to pick up more deer feed and a bag of oil seed for the birds, as the grocery store while she was picking up a few things herself. 😀 ). Another thing I had to think about was an email I received. The person who vandalized our gate had got a friend to talk to my mother on his behalf, to try and get me to drop the charges. This email was from someone else – I was expecting to hear from this person at some point – asking me to consider dropping the charges. I was not going to respond to it right away, but I did forward it to family members who need to know what’s going on. That, in turn, lead to phone calls and emails with feedback as well. In a nutshell, my family is in agreement about not dropping the charges. Even my mother is on board. To paraphrase, I’m told that the person who vandalized our gate had a breakdown from the stress of not having unfettered access to the farm. It was the lock on the gate that drove him to do this. Of course, the actual phrasing was different; I have no doubt that he is going through a difficult time and I was glad to be told that he is finally seeking help for his mental health, but ultimately, it was all about him and how hard things are for him, all these other things are why he did what he did. No real taking responsibility at all. Interestingly, while he told this person about what he did, because he supposedly felt so bad about it, and he called to arrange help for his mental health before he even knew charges were being laid, apparently at no point in all this did he think that maybe he should let US know what he did. If it weren’t for the trail cam, we’d be in the same position as when we found the locks glues again; we would know who did it, but have no proof. What did he think we would do, on discovering the gate the way he left it? Just ignore it? Pretend nothing happened? Let it slide? Was he just going to leave us hanging? Not something I wanted to be dealing with around Christmas, that’s for sure. Instead, we focused on our traditional Christmas Eve dinner, but even that changed. One of my brothers and his wife was coming out to join my mother for church, before heading out for a few days, and would I be coming, too? I had not intended to, but I did want to see them before they left, and pass on a gift as well. So we started our wigilia dinner after the first star appeared, as is traditional, but only through the first few courses. Before the main part of the dinner, I left to meet them at church. Then, just before leaving, I messaged my daughters that I was coming home, so that when I got back we were pretty much ready to continue with our meal. Before service started and my mother was commenting on what as nice surprise it was for me to be there – but how unfortunate it was that my daughters weren’t – I told her that they were taking care of things at home, and that I’d left half way through our dinner. Oh, she tells me. There’s always tomorrow. So she was happy to see me, but it still wasn’t good enough. It does get exhausting after a while. The rest of our evening went well, however. Once at home, the only interruption we had was a sudden cat fight outside. !! My daughter went out to break it up, but all she could see by then was Ferdinand, disappearing into the dark. He seems to be the instigator of cat fights, these days. With so many courses, our traditional feast lasts several hours, so it wasn’t long before midnight when we were done. We stayed up a bit longer, then opened our gifts before heading to bed. When I headed out this morning to feed the critters, this is who I found, starting at me! 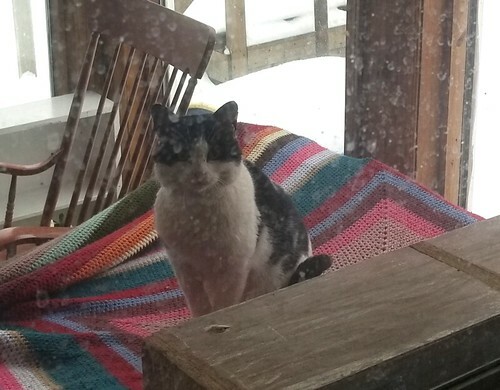 He is getting more comfortable with seeing us through the window, though he does still run off once the door is opened. 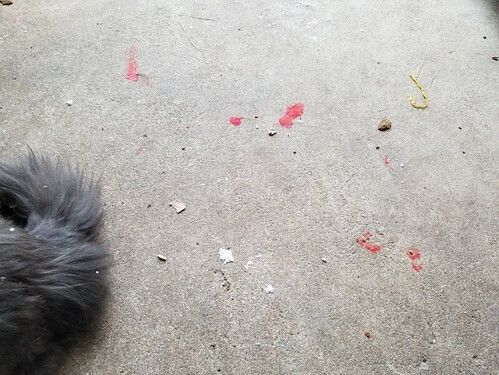 As for the cat fight last night, evidence shows it started right in the sun room. 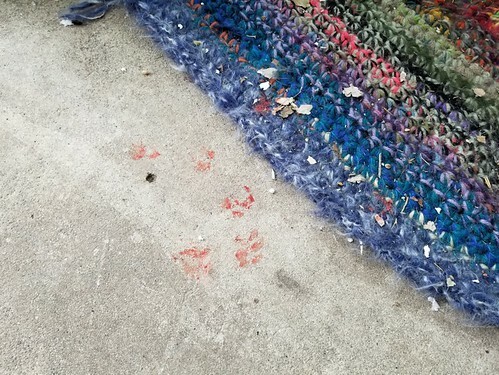 Ourside, I could see a trail of little bloody paw prints, leading to where they go under the storage house. Clearly, Ferdinand was not the one who was wounded. 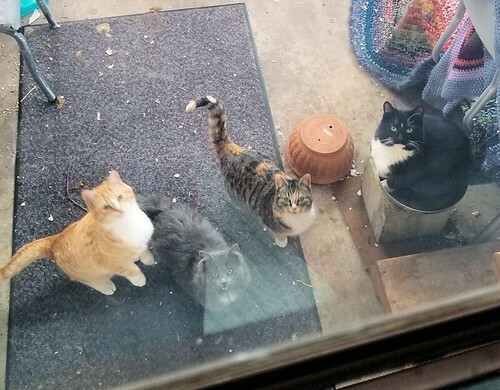 None of our regular cats or kittens seems wounded. 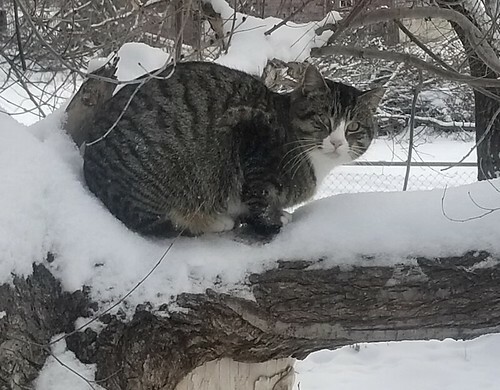 Slick seems fine, too, and this evening, my daughter told me she saw Nicky the Nose through the bathroom window, so he seems fine, too. So we have no idea which of the cats got hurt! Our Christmas day was otherwise nice and quiet. While we opened our gifts last night, we save our stockings for Christmas morning. Then, this evening, we had a more formal dinner again. It was all quite next and peaceful, which was much appreciated! Peace is something I really appreciate these days. There seems to be so precious little of it of late.